Could this be the best carrot cake? Like many other food bloggers, homebakers and homecooks, I shy away from calling a recipe the “best” ever recipe for whatever it is I have concocted – tastes, preferences and favourite ingredients are liable to change over time. Besides, what do people even mean when they say that something is the “best” ever cake/muffin/cookie recipe? Surely such judgment is highly subjective. Take brownies for example, some people have to have nuts in them, ideally walnuts, others abhor any kind of nuts in their brownie, most people want their brownies to be perfectly fudgy, while others find fudgy brownies cloying. What constitutes the perfect brownie for one person can be miles away from the perfect brownie for someone else. With that said, below is what I would call “my” best carrot cake recipe – “my” in the very loose sense of the word since the recipe is not my recipe at all – I think it was my sister Helena who originally discovered the recipe on the Pioneer Woman’s blog a few years ago. But, suffice it to say, that out of all the carrot cake recipes I have tried over the years (and the many pieces of carrot cake I have eaten over the years, from the slice I ate for my 16th birthday cake while on a student exchange in Brisbane to slices eaten in my long-time favourite coffee shop Tinderbox in Islington, London, to trips to the US and home to Germany), the recipe below produces what I would consider the best carrot cake – this incredibly moist, nutty and orange-speckled cake, so full of spice that you wonder what combination of cinnamon, ginger, allspice and nutmeg is mixed into the batter. And yet the recipe is simple, both in its list of ingredients and its preparation. I think the secret is in the amount of cinnamon that goes into the batter – a full teaspoon! With a few tweaks here and there (less sugar in the cake batter, a different technique for mixing the ingredients together, doubling the amount of frosting and using different ratios of cream cheese, butter and powdered sugar for the frosting), this recipe is a total crowd-pleaser and is me and my sister’s go-to carrot cake recipe. At the birthday child’s request, I baked this cake for my mum’s birthday this weekend – you know you are on to a winner when the birthday child takes the first bite of birthday cake and closes their eyes while a smile slowly spreads across their lips. Oh and if you haven’t come across the Pioneer Woman’s blog before, go and have a look now – there is plenty to entertain you, from photo tutorials to the story of how the Pioneer Woman met her Cowboy to mouthwatering recipes, her blog has it all. 1. Pre-heat the oven to 175 degrees. 2. Sift the flour together with the pinch of salt, baking powder, baking soda and cinnamon. Mix in the chopped walnuts. Set aside. 3. Place the egg yolks and the sugar in a bowl. While beating the egg yolks with the sugar using an electric whisk, slowly drizzle in the oil. Once all the oil has been absorbed add the egg whites in one go and beat for 1-2 minutes until combined with the egg yolk mixture. (Creating an emulsion with the eggs and the oil first ensures the a light and fluffy cake that is not oily in the slightest). 4. Add the grated carrot and the dry ingredients to the wet ingredients and quickly stir everything together until there are no more pockets of flour left in the bowl. 5. Pour the batter into a greased springform and bake for ca. 45 minutes to 1 hour or until a wooden skewer inserted into the middle of the cake comes out clean. 6. Take the cake out of the oven and leave to cool for 5-10 minutes before carefully removing the spring form and leaving the cake to cool completely on a wire rack (if the cake isn’t fully cooled the frosting will melt when you spread it on). 7. To make the frosting, start by beating the butter and icing sugar together with an electric whisk until all the sugar has been absorbed by the butter. 8. Add the cream cheese in one go and beat to combine the cream cheese with the sweetened butter. 9. Once all the cream cheese has been mixed with the sweetened butter, beat the frosting on high for ca. 5 minutes or until the mixture is pale and fluffy. P.S. I did actually bake a second birthday cake for my mum this weekend – a four-layered coffee genoise sponge, drizzled with coffee simple syrup, filled with a chestnut creme patissiere and covered in a dark chocolate ganache. While the chestnut creme patissiere was divine, the dark chocolate ganache was a bit overpowering. I had wanted to avoid using buttercream but I think the chestnut creme patissiere needs something a little less “in your face” than the dark ganache. I am thinking that coffee-fondant glazed eclairs filled with the chestnut creme patissiere might be the way to go. So I will have to experiment a bit more but I am already looking forward to sharing with you the recipe for the chestnut creme patissiere, it was that good. Please do – I have yet to find someone who does not like this cake so I am curious to see what you think. Thanks! It definitely is for me … can’t even remember how many times me and my sister have made this! Hmmm, this looks pretty ‘best’ to me. I like carrot cake that isn’t too heavily spiced so this sounds pretty much perfect. Agree – some American recipes I have seen add a lot of nutmeg which is just weird to me, not a spice I typically use in baking! 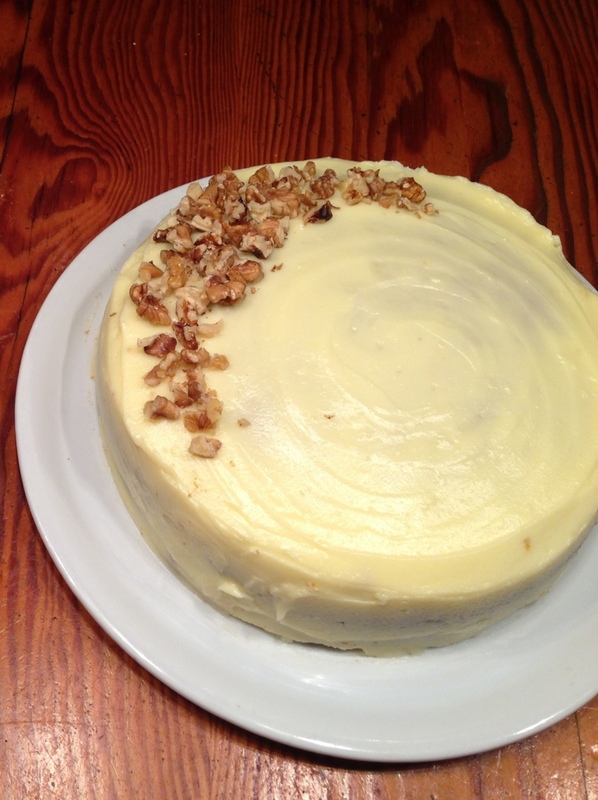 In Germany we make Carrot Cake (called Rueblitorte) with ground hazelnuts – amplifies the ‘nuttiness’ of the cake but changes the flavour completely … this is much better! Thank you for providing this information online. This recipe looks absolutely divine! I like my carrot cakes really nutty and spicy, so I’m looking forward to giving this a try soon. Thanks for stopping by and do give the cake a try, it is absolutely worth it! I stopped by your blog as well – having moved to Rome in November only I so identify with your thoughts on language and culture issues!